Every year, Dad would spend the entire Labor Day weekend roasting, pickling, and canning for the winter months. He didn't need to. We lived in Providence, Rhode Island where virtually every street corner boasts an Italian deli selling all of the foods he made. But like stocking food in his basement, Labor Day canning was a ritual that was ingrained in Dad. My father grew up in an Italian family with two parents and six siblings. Since this was before Costco, it took some resourcefulness to feed all of those growing bodies on a meager income. So his parents would often buy vast amounts of foods on sale and pickle, roast, stew, can, and stuff anything that could take it. August was the month of hard labor in Dad's house. I love to hear him tell stories of the "assembly line" he and his siblings made to be efficient -- they had to be. After all, they would cook dozens of bushels of summer tomatoes to be used for Sunday gravy throughout the winter. And they would tackle scores of crates full of late summer eggplant, peppers, and cucumbers that were pickled or roasted then jarred and enjoyed year-round. Throughout my entire life, Dad would go to his cousin Nicky's farm to buy produce. Every single Labor Day weekend, he'd arrive home and announce with pride to my mother, "I just got some beaut--ee-ful red bell peppers from Nicky's." "Oh, yeah? How many did you get?" she'd asked, fearing his reply. "Not too many this year. About three bushels," he'd say. "Three bushels? What are we gonna do with three bushels of peppers?" she'd ask reflexively, knowing his reply before he could answer. "I'll roast them tomorrow while the telethon is on," he'd say. And I would let out a big, dramatic, sigh. "Ugh. Another Labor Day spent roasting peppers with Jerry Lewis." After I was married, I decided I would never spend Labor Day weekend watching the telethon or cooking, and for years I didn't. Until one fateful day a few summers ago when I found a farmers' market selling an entire case of red bell peppers for $11. I felt like I had hit the jackpot! As I proudly stumbled along with my big box of peppers, Jeff stood looking on, aghast. "What are we going to do with a whole case of peppers?" he asked. And that's when it hit me. I am my father's daughter. I realized then that Dad didn't roast peppers on Labor Day just to torture me; rather, I think he believed that unlike the fleeting pleasure of going to the movies for a couple of hours, roasted peppers would bring you happiness for months to come. I did end up roasting peppers that Labor Day Weekend, though I did not turn on the telethon. Then like Dad, I froze bags full of roasted peppers that Jeff and I enjoyed year-round. Since our local market had red bell peppers on sale for 47 cents each last week, I bought a dozen. On Thursday I went down to the grills and starting roasting. I didn't miss Jerry Lewis, and I didn't miss the back-to-school dread I always experienced, but I did miss Dad. I know you can buy jarred roasted peppers, but where's the challenge in that? 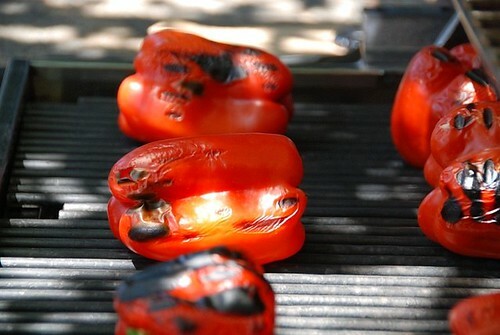 Note: If you don't have a grill, then you can roast or broil the peppers in the oven. You can even place them directly on the burner of a gas stove. 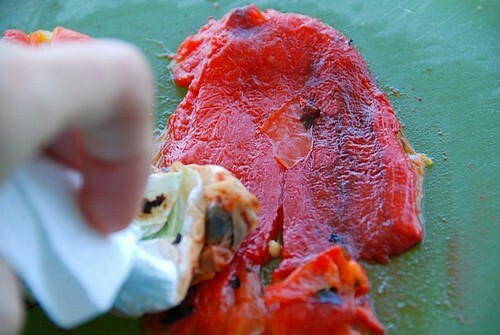 To freeze roasted peppers, place cooled peppers in a single layer in a Ziploc freezer bag. Defrost by placing in the refrigerator until thawed or by defrosting in the microwave. After about 10 minutes of grilling, the peppers will begin to form black blisters. After about 20 minutes, they will become fully blackened, like the middle left pepper above, and should be removed from the grill and placed in a paper bag to steam. After the peppers have steamed in a paper bag for about 10 minutes, place them on a cutting board, split open, and remove the stem and the seeds. You can see how the skins are already beginning to peel off. Using a piece of paper towel, rub the skins off. Add to an antipasto with items such as Italian cheeses and cured meats, olives, marinated mushrooms, and peppadews. Finely chop and stir into tomato sauce for pasta or stir into soups. Dice and add to a fritatta or omelette. Dice and blend into hummus or a favorite dip. Add to crostini, bruschetta, pizza, or sandwiches. Make grilled vegetable stacks with eggplant, zucchini, peppers, and fresh mozzarella. You are your father's daughter indeed :) Glad you had a productive labour day weekend Susan! What a nice story. Funny how we end up doing a lot of the same things as our parents! A simply darling post Susan. I'm picturing you as a little girl, peeling the skins off the roasted peppers with your dad. What a fun memory. And I agree that roasted peppers are fantastic. They never get very cheap around here though, darn! And I'll bet it is because of those times when you were young, cooking with your dad, that it has has such an influence on your interest in food as an adult. It definitely did for me. Nice post Susan. I love your family stories! Your Dad is such a character! Great post Susan! does he read your blog all the time? you crack me up :) and the pics of those peppers are stunning! can't wait to go out and buy two tons of peppers and get roasting myself! Interesting... I love the unique flavor of grilled peppers! Ha ha ha! Well, that is kind of a beautiful thought. It's become a family tradition, don't you think? ;) How did your dad can them? In brine? I love grilled peppers but never thought of freezing them. It's funny how we all end up doing things we didn't like when we were kids. I roast my peppas under the broiler, cut into thirds, I find it the easiest way. I make them weekly for sandwiches & salads. And now that I am big girl, I LOVE Labor Day! No school for me tomorrow! This is a very sweet story, made all the more so by you roasting your own peppers - on your terms, and loving it. Great post....love the story and am with you on the telethon! After reading this story, I think I'll associate Labor Day with roasted red peppers from now on, too! Looking good w/the peppers - but u already know that. I love this with just a bit of olive oil and a drizzle of balsamic! What a wonderful post and story. I might just have to get myself a whole bunch of peppers now, as you have succeeded in making what can be seem like a mundane task very appetizing. Loved your story:) Great tutorial too! Roasted peppers in a garlic vinaigrette...mmmm. My sister makes the best salad that way. I love them any which way. I enjoyed reading your post. It is lovely to realize that family traditions are passed on to us. Jerry Lewis... really popular with the French. We use to watch his movies a lot growing up. Love it, made me laugh. I absolutely adore the smell of grilled red peppers. There is almost nothing better. Oh this is too funny! My grandma used to make pie crusts and freeze them and would have Lawerence Welk on the TV as she did it. It was just how she did things, like your dad. Ooh one of my favorite foods--and now I know how to make them myself!! I love the suggestions too--the grilled vegetable stacks sound like a perfect dinner treat! Great tale...it's funny how we eventually turn around & do everything we cringed at earlier. YES YES YES to roasted peppers. Home done ones taste way better than bought ones. Great post Susan!! What a great story Susan! The older I get, the more I like to keep these family traditions! Isn't it funny how we finally adopt them? 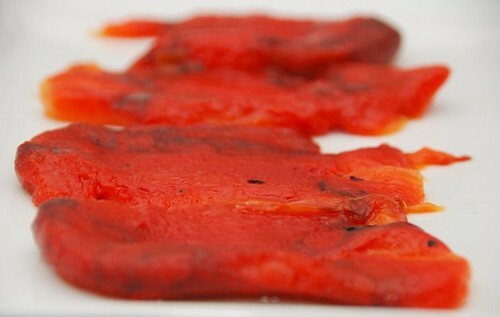 oh my... i love roasted red peppers like that and all those photos are making my mouth water. we do this a lot in the summer also. i love the sweet, charred smell that comes out. beautiful susan! I can identify with your story. My grandmother used to bring in bushels of plum tomatoes from their vegetable garden to be canned for the winter for Sunday's sauce!!! Great story:) I guess we all turn into our parents at some point! I love roasted peppers too. Ha ha - loved the story. I don't think I've ever watched that telethon. I love roasted red peppers. Haha - I spent all day yesterday canning marinara sauce, wondering why I was working so hard on what is supposed to be a labor-free day! Now I'm wishing I would have planted red bell peppers! What a great post. Isn't it funny how we spend our entire childhood thinking how NOT like our dorky parents we want to grow up to be... and then one day you wake up and realise you *are* your parents. I am SO my father's daughter, and he used to call me and my mom The Clones. I love roasting peppers but have never tried freezing them - until now. Thanks for the idea! 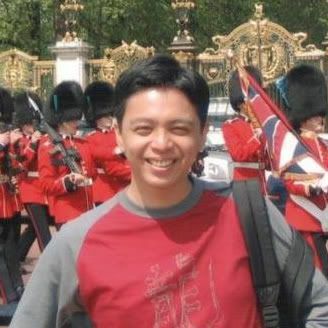 Nice nostalgic moments, enjoyed reading ur lovely post Susan,and thanks for the tips. 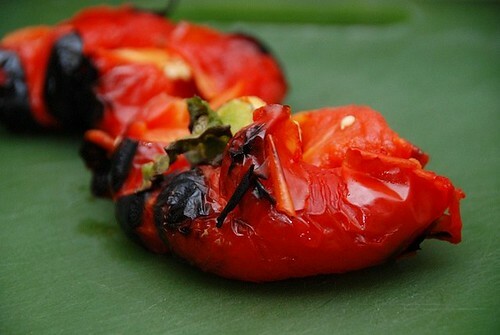 I love good roasted peppers- talk about a sweet treat! It's funny that years and years can pass since we attended school and yet we still feel a slight sense of dread when Labor Day comes around. For me, it simply means the end of 'summer' even though summer doesn't really end until Sept. 21. Our summers in MN are so fleeting. kalyn-They're usually pretty expensive here too. marie-Oh, yes. He is my #1 fan. Seriously. mark-He often made pickled peppers with a vinegar base. lynda-Yay! I'm happy to hear it. alexa-Isn't that funny that JL is popular in France? Who would have thought? kristen-My dad is still a huge Lawrence Welk fan! deeba-I'm so glad you liked it. nuria-It really is amazing, isn't it. History does repeat itself. aran-Well, thank you so much! debbie-I guess most families have similar traditions, don't they? astrofiammante-And his family is from the south, so it makes sense then. emiline-I'm glad you enjoyed it. jeanne-The Clones. How funny! Do try freezing them. They're great. lyb-Many thanks for your kind words. kate-I get that dread every year; it's ingrained in my psyche. 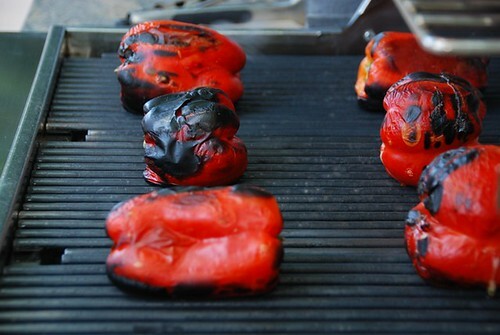 Susan, the only acceptable way to roast peppers is on a grill. The charred smokyness is a non-negotiable for me....these are as hearty as meat! i wish i had a grill! i used to be able to roast peppers in our townhome, at least, over the gas stove...but now we have an electric stove so i am stuck buying roasted red peppers! I know this is an old post (one of the first ones I read on your blog! ), so I hope you still see this comment. I always seem to have trouble getting skins all the way off -- I can get most of it, but there's always a pesky spot or two that won't come off. Do I just need to roast and/or steam longer? Is this a byproduct of impatience? janelle-I'm so happy to hear from a long-time reader. Thanks for the question. Steaming them longer does help the skin to slide off more easily. But even then there is the occasionally piece that clings tenaciously.